We made a 1-minute video, which we posted on our Instagram page to encourage business owners to come up with a BIG vision for their businesses. 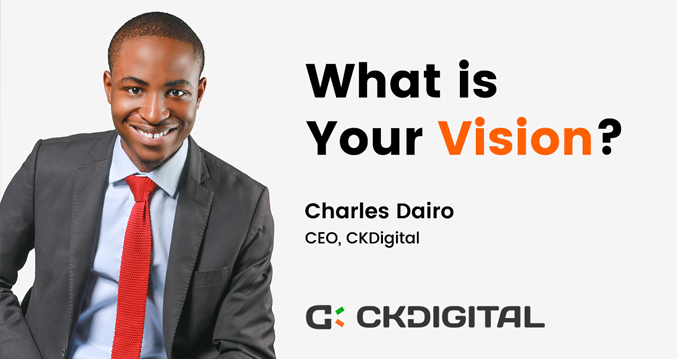 In the video, I also shared why and how we came up with his vision at CKDIGITAL. CKDigital will become the world’s biggest digital agency. As at the time of writing this, we are primarily a Web Design and Development company, a small business with small-business challenges, but this is the least we will be. We will offer excellent digital products and services that ‘transform’ businesses of any size, organizations and governments. CKDigital will offer excellent digital products and services that transform businesses of any size. We will work with clients all over the world. We will be known for creativity, innovation, excellence, professionalism, integrity, knowledge, and most importantly, results. We will ensure we remain relevant in the digital space. We will become an authority in the industry. We will push the boundaries of what’s possible. We will create jobs for numerous people all around the world. We will also be known to be one of the best places to work: a company of great people, a positive work environment; a company that recognizes and rewards its people. CKDigital will also be known to be one of the best places to work. Our work at CKDigital will however not affect our personal lives negatively. CKDigital will promote work-life balance and ensure that it adds value to the lives of employees, not adversely affect it. We will become a massively successful business. With the money we make as a company, and individually, and by the influence we will have, we will make significant impact in the lives of people. Through CKDigital, we will make the world a better place, in every way we can. We won’t be reinventing the wheel, we will emulate what other successful companies have done, and are doing all around the world, within and outside our industry. A unique combination of factors will make this vision a reality: the loftiness of the vision itself, the visionary, the people involved, our country of origin, the industry, and of course, God’s help. We are in a unique space – technology. Digital is the future, and we are right in the middle of it. By first creating a solid start in Nigeria, we will quickly replicate and scale to other countries of the world. We will be big, fast, and flexible. CKDigital will be big, fast, and flexible. We will need some of the best people in the world to make this a reality. Some we may already have working with us; others will be drawn to us and join now or in future. Follow us on our vision journey: Instagram, Twitter, LinkedIn, and YouTube. Have you been inspired by the video and our vision at CKDigital? Do you have a vision for yourself or your business? We’d like to hear from you: Please leave a comment below, and don’t forget to share to inspire someone else. Not all dreamers are winners, but all winners are dreamers. Do the dream. Thanks for this great reminder. Thanks for your comment, Halimat. Regardless of the reality of our seemingly unfavourable terrain in Nigeria, I strongly believe dreams and visions come through…. …and this will surely come through. Thanks for sharing this to inspire many. You walk the talk and I can attest to this. …nothing is impossible with HIM. Thanks a lot for reading and sharing this comment. CKDigital is awesome. I will always recommend CKDigital to anyone. You guys are Website Slayers…..You deserve the best and the best is yours in God’s name. Website Slayers! Nice one, Racheal. CKDigital has an impressive track record. You guys are awesome. Thank you very much, Tony. We appreciate your comment.